World-renowned beauty brand, Sedu products have a reputation for producing high quality, reliable hair styling tools, designed for the professional hair stylist. All of the Sedu styling tools have been developed to maintain healthy hair while providing effortlessly gorgeous results- so you don’t have to compromise the condition of your hair for that killer hair style. 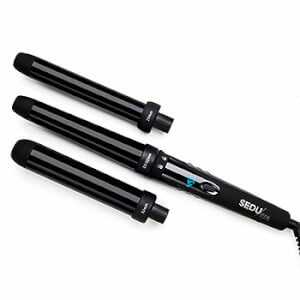 Sedu top products include Hair products, hair dryers, and flat irons. From their iconic Revolution Hair Dryer to their Crane Clips; Sedu has got the product to help you to achieve flawless hair. The Sedu Revolution Styling Iron is not an ordinary flat iron. This versatile hair styling tool has unique curved-edge plates to allow you to effortlessly create gorgeous curly or straight styles; without the need for an abundance of styling tools. The wide ceramic plates are infused with black tourmaline gemstones which help to distribute the heat evenly throughout the hair; minimising breakage and decreasing styling time. You can expect silky smooth, frizz-free locks thanks to Sedu’s ionic technology and the adjustable temperature control allows you to optimise the temperature according to your hair type and desired results. This versatile styling iron is a must-have in any hair styling collection. ﻿The Sedu Revolution Hair Dryer is the first of its kind- boasting over 60% more power compared to conventional dryers, this six-speed dryer cuts drying time by 70% while reducing frizz and static by up to 90%- leaving you with gorgeous, sleek hair. The rapid drying time also reduces damage as the hair is exposed to heat for a shorter amount of time, meaning you can get a big, bouncing blow dry without the damage. When the Revolution Hair Dryer’s Ion generator switch is on- it helps you to create a smooth, sleek style due to the negative ions. When the switch is not in use, it can help to build enviable volume at the roots, allowing you to create whatever style you desire using just one tool. The Sedu Revolution Clipless Curling irons will deliver the ultimate curling experience, allowing you to create beautifully shiny, bouncing curls without the damage. The range of barrel sizes within the collection allow you to create a variety of gorgeous curls, from tight ringlets to loose Hollywood waves, so whatever your style; Sedu have got a curling iron to suit you.